DESIGNED TO ACHIEVE 100 MPH. 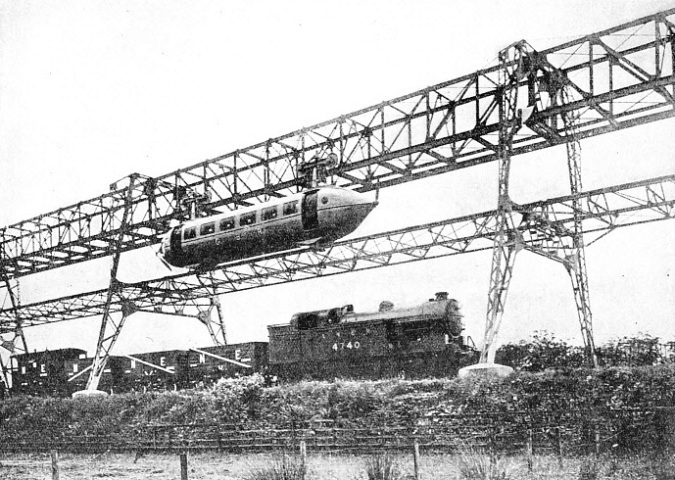 A railplane on a stretch of track over the LNER line at Milngavie, Dumbarton. The track is of a lattice box girder construction, supported at the desired height above the ground, on steel trestles spaced about 80 ft apart. In 1930 a German, Herr Paul Kruckenburg, fitted an air screw propeller to a passenger coach weighing twenty-eight tons. 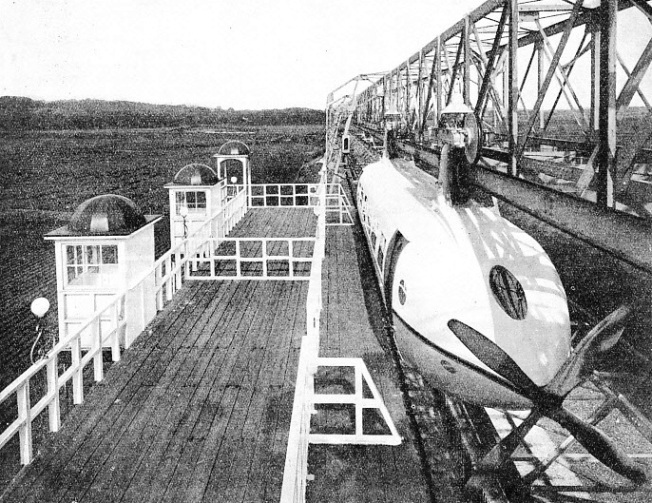 The air screw was driven by a 600 hp oil engine and hauled the coach along a specially prepared length of track in German at a speed at over 140 miles an hour. Herr Kruckenburg did not take chances; his trial track had all movable points removed and there were no curves. His line was dead straight; had he run on to a curve at that speed his coach would have been flung off the rails like a stone from a string. The results of Herr Kruckenburg’s experiments have given encouragement to inventors who are studying this problem of high speed, and they have also demonstrated that the limit of speed on railway tracks is confined to the tracks and not to the locomotives. Realization of these limitations has led inventors to develop their ideas of high-speed railways on lines different from those of conventional railways. One of the most interesting of these inventions is the railplane system of transport. This is a monorail system, the cars being hung from an overhead rail. 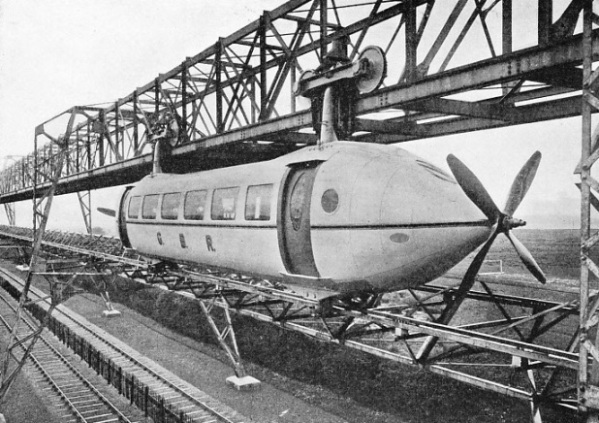 When this system was introduced the idea seemed to be somewhat bizarre but there were those who saw possibilities in the system, and the railplane has been developed. It is claimed to be one of the fastest, safest and cheapest means of land transport. A length of track has been erected over a section of the LNER near Glasgow. The track is complete with equipment and a railplane car has been installed, It is known as the Railplane Test Line, and many interesting tests and experiments have been made. Railplane cars are streamlined, and thus they are able to overcome what will probably remain an insoluble problem in streamline vehicles running along the ground. The under-part of a land carriage can never be effectively streamlined and must always constitute a drag on the vehicle. STABILITY AND SAFETY. The cars are suspended from bogies running on an overhead rail. To prevent swaying, guide wheels are fixed in pairs, on vertical axles,and engage with a second rail - the guide rail - beneath the car. With an internal combustion engine, which develops, say, 100 horse power when the shaft is turning at the full speed, say, 1,000 revolutions per minute, the conditions are definite, and a propeller can be designed to take full advantage of those conditions. But if electric motors are to be used to drive propellers, a new field of development is opened up. An electric motor which develops 100 horse power when the shalt is running at full speed - 1,000 revolutions per minute - may be designed to give double this power at a higher speed for fairly long periods. The railplane engineer most consider the efficiency of his machine at every speed, from the moment he starts up to his top speed. which can be as high as over 200 miles per hour. The problems of the design of propellers to meet all the conditions of railplane operation have been solved, and British propeller makers can turn out propellers to fulfil these conditions. The solution of the difficulties brought to light the potential advantages of the railplane cars. The railplane is not limited in the same way as railway locomotives and electric trains in accelerating from the “start” and retarding to “stop”. The railways are obliged to rely on the weight of the vehicle to give the necessary grip on the rails. With the railplane the power is expended in rotating a propeller in air. The propeller acts on the air, setting it in motion, and the reaction from the air supplies the “propeller thrust”. In the railplane the “propeller thrust” is the “tractive effort”. The “propeller thrust” depends upon the design of the propeller, and the character of the thrust is varied according to the type used. Thus the propeller may be designed to give extremely rapid or extremely slow acceleration. On roads and railways the retardation, or slowing down of a vehicle, is accomplished by various methods of braking the wheels. On the railplane mention has been made of a rail bolted on the underside of the rail beam. When the brakes are applied they do not grip the wheels of the railplane bogie. The brakes act by one brake shoe gripping the top rail and a second brake shoe gripping the bottom rail. There are two separate brakes on each bogie carriage. One is manually operated by the driver, and the other is controlled by the signalling system. Powerful springs control the amount of “grip” of the brake shoes on the rails, and by this method of braking the retardation can be adjusted to suit the service conditions. The retardation can, for instance, be set to be equal to that obtained with maximum braking on a London omnibus. This is about four times greater than the retardation allowed in railway practice. The railplane can run up a gradient as steep as 1 in 27, and thus the system would not require heavy and expensive earth-works and structures common to the ordinary railways. Bridges, tunnels, cuttings, and embankments would be eliminated, but at the same time the cost of erecting the continuous railplane track at well above ground level must not be overlooked. You can read more on “Experimental Locomotives” and “Railway Curiosities” on this website.